Patrik Lindström Electropop, Electro If you manage to look past the Melody Club alike apperance, you'll find a pretty great industrial and electro pop cabaret in the album 'Disco Vandalism'. Mechanical Cabaret's albums are often a pretty varied experience with many influences and different hardness, so at first you might be fooled that this is an regular release, but as a couple of tracks pass you buy, you'll see the cracks in the illusion, because this is actually an remix album. The remixed tracks on this album is taken from his two latest albums (out of three excluding this one) called 'Product For Your Insecurity' and 'Damaged Goods'. Even though that some of the remixes are pretty fucked up, like the track "Pretty Fucked Up", their common denominator is the popesque melodies and track structures, as they are combined with different approaches, some synthpop, some more glam and electropunk and some even tend to a more industrial style. You would thought that the variation would turn your brains inside out, but since the common denominator manages to tie things together, you'll never feel like you are on bumpy roads. In general, I truly hate remix albums, since they tend to used as fillout in band's discographies, products from the minds of label managers or simply tossed together without care. Here you can really feel that it's been handled with such care that it easily could have come off as their fourth studio album. I'm suprised to say it, and I might blame personal disorders if later diagnosed by a doctor, but I really enjoy this album. During the past few weeks I've tended to go back to this album every time I get tired of the other material I'm about to review, and I think you'll experience the same. My favourite tracks are "See Her Smile (Size Nine Remix)", "GBH (Real Horrorshow Remix)", "Ne Plus Ultra (Dr Rouge Rework)", "Careful, Careless (Fur Coat No Knickers Mix)" and "It Will All Come Back 2 U (M-ZR0 Vendetta Mix)" with it's amazing sound and melody. 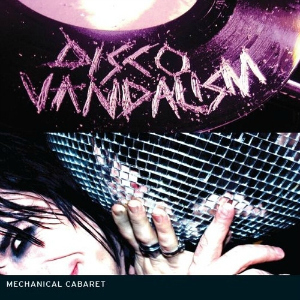 If you manage to look past the Melody Club alike apperance, you'll find a pretty great industrial and electro pop cabaret in the album 'Disco Vandalism'. Mechanical Cabaret's albums are often a pretty varied experience with many influences and different hardness, so at first you might be fooled that this is an regular release, but as a couple of tracks pass you buy, you'll see the cracks in the illusion, because this is actually an remix album. A truly great first real impression of this artist that drove me to listen, and equally enjoy, their earlier work.